Having a stash of tissue paper leftover from G’s Easter bonnet, I found myself browsing Pinterest (always dangerous!) 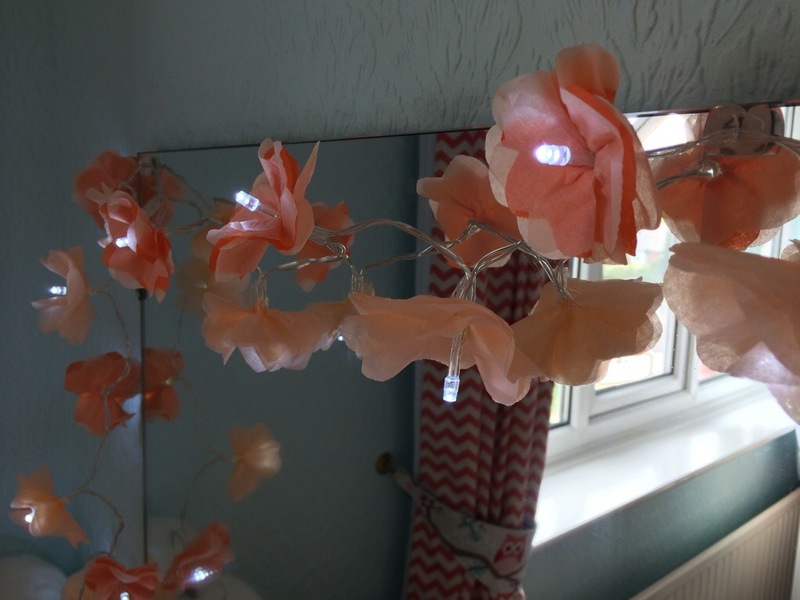 and came across a few different pictures of tissue paper lights. A quick rummage through the Christmas decorations yielded an unopened strong of LED fairy lights which were perfect – I understand that they have to be LED ones so there’s no heat risk with the paper. I decided to try out a different technique for making flowers so cut orange and peach tissue paper into squares approximately 3″ wide. Taking a few layers at a time I folded it in half then half again, and then folded on the diagonal. On the outer edge I cut a petal shape, then cut a small but off the inner point so as to make a hole in the middle which the lights could go through. I wanted to alternate between plain peach flowers and ones with a shot of orange to add a pop of colour. For the plain peach I used three cut flowers laid on too of each other, for the others I swapped the middle piece for orange. All I had to do to make the flowers was slip the light bulb through the hole in the middle of the flower, gather and scrunch the base slightly, and add a bit of sticky tape to hold it in place. Florists tape or even either a dark green or coordinating colour electrical tape would probably have been neater but I didn’t have any to hand. I’m really pleased with the result, and the fact it took less than half an hour start to finish! 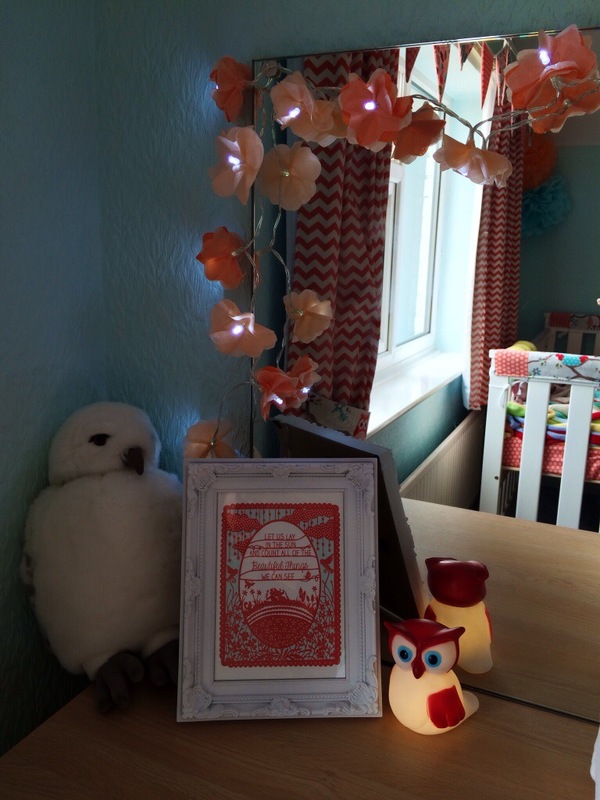 One more step towards finishing C’s Mum-made nursery decor – maybe I’ll have finished by the time she’s 16? !